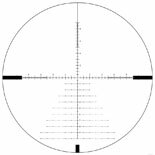 The new and ultra-affordable Vortex Diamondback Tactical 4-16x44 riflescope features a first focal plane EBR-2C MRAD reticle. Diamondback Tactical FFP riflescopes feature Vortex’s XD™ Premium Optical System that provides exceptional resolution and edge-to-edge clarity. The lenses of the riflescope have been fully multicoated to ensure optimal light transmission for low light performance. The Diamondback Tactical FFP 4-16x44 is a great option for anyone looking for a first focal plane riflescope at a second focal plane price!